They say that the best way to prevent problems is through regular maintenance. And just like with other items around your home, the same can be said for your yard. 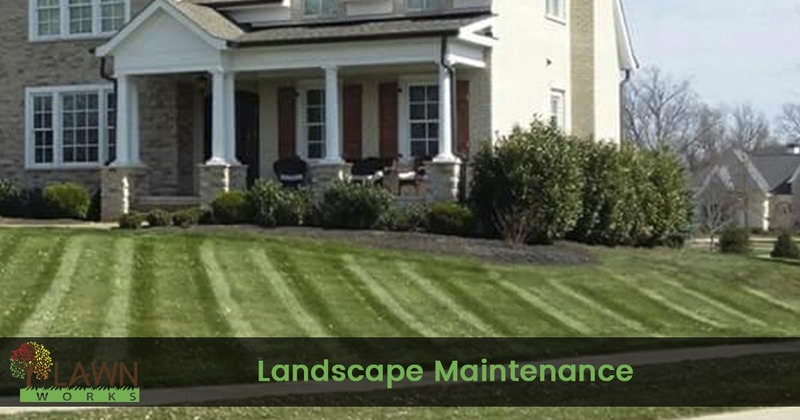 Professional landscape maintenance is the best way to keep your lawns looking lush for longer. While most people only think of cutting their grass, most homes have numerous plants requiring care. Unfortunately, with your hectic weekly schedule, flowers and grass are often the first household chores to become neglected. And while you may consider hiring a landscaping company, you might be worried about the cost. Instead, you can call Lawn Works for your home’s landscape maintenance services. We offer a variety of items that work together to keep your yard looking great all year round. Whether your yard has a weed problem, your grass is looking patchy, or your trees and flowers have started drooping, we’ll make sure everything receives the care that they need. From professional cutting and trimming to better plant nutrition, we do it all for less! Lawn service shouldn’t end at pushing a lawnmower. Our team has been offering better landscape maintenance since 2015. And more ways to keep your yard green and healthy. Whatever type of services you are searching for, our team offers it all. Call us for the best in local lawn care professionals. As your best landscaping service, we have what it takes to care for any plants that your home has, any time of year. From providing preventative steps to keep them alive during winter, or preparing your yards for new spring plant growth, we’re here to help during any season. Not all homes require the same landscaping services. However, whatever methods your plants need, we offer them all and more. Our team of experienced yard maintenance professionals can save you a ton of time and money. We know what plants need, sometimes before they do! From aggressive weeds to fast-spreading plant diseases, root problems, plant overgrowth, and more, we’ve seen nearly every issue a homeowner can have. But no matter what your home needs to look its best, we can offer it each time. When you choose us for your lawn maintenance needs, you can rest easy knowing that your plants are in great hands. We pride ourselves on being the dependable choice for local yard care service. If you aren’t getting anywhere in assisting your grass and plants, or you just give up trying to maintain it all on your own, then call us today and save yourself the hassle. Our professionals offer the best service each visit, helping you keep the perfect lawn for longer. Call us now and schedule your consultation. Discover how choosing us is among the best investments a homeowner can make!